Unus Tactus - The app with T.L.C. : Touch. Locate. Call. Unus Tactus - the app with T.L.C. (Touch. Locate. Call.) was developed to assist people of all ages with mild cognitive and/or motor deficits by allowing them to have an easy to use cell phone, with a simple set up. It utilizes a one touch photo dialing system to generate phone calls using phone numbers from your existing contacts or ones that are imported directly. 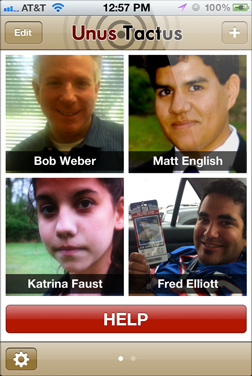 Unus Tactus simplifies the calling process by turning your iPhone into an easy-to-use, one touch photo dialer. Your contacts are displayed in a 4x4 grid which shows both the contacts name and a large thumbnail photo. A single tap on any of the names or thumbnails will place a call that particular contact. Unus Tactus allows you to enter in both an emergency phone number and email address to maximize the users chance of getting help during times of distress. A large, red HELP button is visible anytime you launch the application. When the HELP button is tapped, two separate processes are kicked off. First, a phone call is immediately placed to the users emergency contact phone number (a friend, a family member, a local hospital, etc). Secondly, an email is immediately sent to the users emergency email address alerting the emergency contact that the user has placed an emergency call. The email includes Google Maps link showing the user's exact location. Unus Tactus features a customizable geofence with immediate email alerts. The geofence will allow the user to notify their emergency contact when they have left a designated radius of a given location (i.e. when the user is more than 5 miles from their house). When the geofence alert is triggered, an email is sent to the user's emergency contact including a Google Maps link to the user's exact location. If you know the user's iCloud login, we also provide a convenient iCloud link to track them in real time. Unus Tactus is available now on the App Store for just $9.99. Click here to purchase the app today!